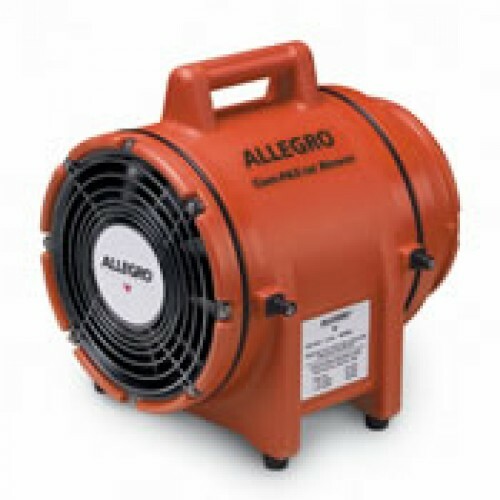 This Allegro 20cm AC Plastic COM-PAX-IAL Reversible Blower is a versatile system featuring the 20cm COM-PAX-IAL blower with canister and ducting. This lightweight unit is designed with the quick-connect clipping system which allows workers to attach the canister, tools-free, to the input side for powerful extraction or output side for ventilation. The ducting stores conveniently within the canister. Ducting is available in two lengths – 4.72m or 7.62m. The special design features include blower and canister built-in carry handles, built-in On/Off switch and “Safety” orange colour. Polypropylene nine blade fan. Ducting can be attached to either end to meet requirements of extraction or ventilation.